The idea for a chocolate company sprung from a road trip John took around the Northeast in search of innovative concepts in food. A boutique chocolate company seemed like the perfect idea as it was fun, creative and could be mixed with local ingredients such as mint from urban school gardens. We got right to work and launched John and Kira's in 2002. Before we knew it, the editors at Gourmet Magazine picked up on our confections and declared them their "favorite chocolates," prominently displaying our creations on the cover of the Valentine's Day issue of Gourmet in February, 2003. 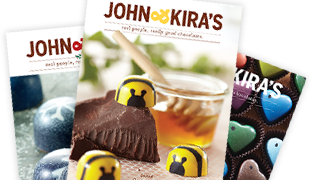 From those humble beginnings John and Kira's has grown and developed many clever and whimsical creations such as Chocolate Ladybugs, Bees and most recently a "Comfort Collection" featuring handmade marshmallow and peanut butter confections. Today we continue to focus on ethical sourcing and innovative design and look forward to many more years of creativity and chocolate!